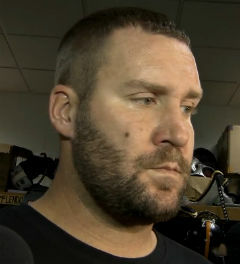 Ben talked about his comfort level with the no huddle, his no quit mentality, Sunday’s game against the Bills, and more. The offense seems to do better when you are in no-huddle. Is there talk about going more no-huddle? We will see how the game plays out. If it calls for it, we will do the best we can at it. If it calls for us to stay in big packages, and run it and do things like that, then we will do that. How often have you gone no-huddle in the last few years when you are tied or ahead in the game? You’ll have to look back on it. We feel comfortable doing it. We put a lot of colabertation during the week in it, coach, myself and the players. We do a lot of talking and communicating, so it’s kind of a group effort. Are you still lobbying for it? I just want to win, however that is. If it’s running the ball, throwing the ball, no-huddle or huddling every time, whatever it is, I just want to win games. What can this team accomplish during the second half of the season? A lot, if you ask me. Like you said, there’s a second half of the season still to come. You aren’t going to see any quit. We will just have to see where it goes, one game at a time. Is it a one win at a time mindset? Yeah. For me, we are 0-0 and trying to get our first win. That will have to be the approach the rest of the way out. You are right. Winning does help a lot of things. So, we will do our best to get that. On the interception that was intended for Antonio Brown, is that all on him or on everybody? That’s last game. We are going to move on from it. It’s just something that we will get better and improve on. We all made mistakes. We just have to try not to do that. They better. I said I am not going to let anyone – and I haven’t seen anybody do that. I haven’t seen anybody, or the signs or anything. I am just speaking on my behalf. I am not going to quit on this season. You went through this in 2006 when you were 2-6 and finished 8-8. Is the feeling similar? Yeah. Honestly, it’s tough. But at this time of year, and maybe we did the same thing then, it’s one game at a time. You are trying to get to 1-0. That’s the approach we have to take. We can’t look at the big picture and what is everybody’s record? Are we in the playoffs? It’s just one win this week. Who do we have, who do we play and how good can we play? Are you worried guys might quit? No. I know when I said that, I thought maybe that might get taken the wrong way. I am not worried about anybody quitting. Let me say that first and foremost. It’s more about I am not going to quit. I am going to make sure. Just like at the end of that game, everybody was busting to the last play. I just want to make sure that keeps going. Does this team need to learn how to win again? I don’t know. How do you lose winning? I don’t know how you lose that feeling. We just need to find a way to get a win and just let it build from there. You can read rest here. You can watch & listen to his interview here. “Roethlisberger, of course, would play in a body cast if you let him.” — Joe Starkey, from his column today at the Pittsburgh Tribune-Review. “The Steelers have the quarterback so you’re good. Everybody wants to have Roethlisberger, Brady, Manning, Brees.” — Terry Bradshaw, from an article at ESPN.com, on the biggest reason he feels the Steelers will not necessarily be down for long. “My best friends son, Frankie, who suffers from Duchenne Muscular Dystrophy, was a lucky participant of the Steelers and Big Ben, allowing him to meet the team, get pics with them, tickets for that weekend’s game, and autographs because he was granted his wish, through the Make-A-Wish Foundation. Big Ben and the Steelers organization make me VERY proud to be a Steeler fan because of their selfless acts of kindness to these children who suffer from disease and sickness. It makes these children so happy to meet their heroes.” — Fan Heather Marie Fries, on the site’s Facebook page after she read the story of 8-year old Tony Cook (post below).